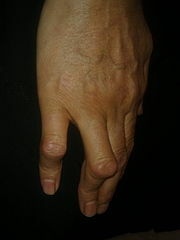 Jersey Finger represents rupture of the Flexor Digitorum Profundus. This usually happens when an athlete grabbing an opponent's shirt undergoes forced extension of the DIP while it is flexed. For this reason, it is called "grasping jersey finger" or "rugby finger". The ring finger is involved more often. The rupture of the FDP tendon from its insertion on the distal phalanx known as Jersey Finger is often misdiagnosed as a sprained or "jammed" finger, as there is no characteristic deformity associated with it. The injury is typically caused by forceful passive extension while the flexor digitorum profundus muscle is contracting. 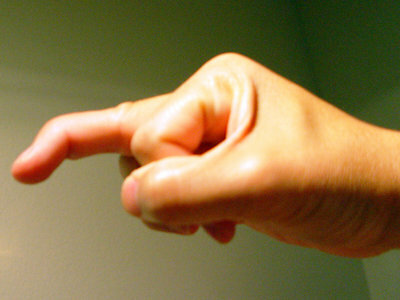 A common example is in football when the flexed finger is caught in a jersey while the athlete is attempting to make a tackle; hence the term jersey finger or rugby finger. To test the integrity of the tendon, the clinician isolates the FDP by holding the MCP and PIP joints of the affected finger in full extension, and asks the patient to attempt to flex the DIP. If it flexes, it is intact. If not, it is ruptured. An x-ray to see if there is any damage to the bone. Most mallet finger injuries at the DIP joint and most acute boutonnière deformities can be treated with splinting and the supervision of an occupational therapist. Use the physical examination to differentiate a boutonnière deformity from a pseudo boutonnière because the treatment is markedly different. Sagittal band rupture treated with splinting may take longer than with operative repair, and this may be a factor in the elite athlete. Surgical intervention: all complete flexor tendon injuries should be surgically repaired or at least referred to an orthopedic hand surgeon. Tendon retraction and time from injury are key. 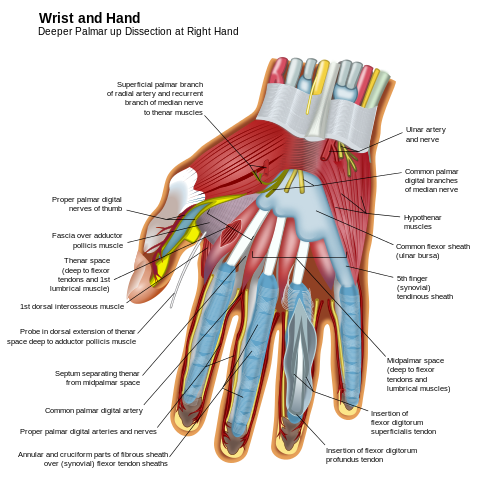 The tendon must be reattached to the distal phalanx. The rehabilitation of the condition is important as flexor tendons often become very stiff if not treated properly. Because early motion of the healing finger is critical, passive flexion exercises begin about one week after surgery. These exercises, along with strengthening exercises using putty and hand therapy balls, can alleviate stiffness and reduced range of motion, frequent complications of finger surgery. Care must be taken not to introduce too much stress too early, or healing will be slowed. Physical therapy can also reduce the risk of repeated injury. Therapists perform wound care to the surgical incisions and move the fingers according to a specific protocol that will help restore finger range of motion, as well as pinch and grip strength to your finger. Although most people recover full hand function following a jersey finger injury, they typically cannot return to playing sports for four to six months. In the meantime, regaining the use of fingers will enhance the quality of life and allow patient to perform daily activities free of pain and with maximum flexibility.